The core team behind Big Media have been working on internet projects for devices other than computers for over a decade. As far back as 2003 both Paula Taylor and Malcolm Stewart were involved in pioneering project work to deliver internet services to TV. Behind this work was the drive to engage people who wouldn’t, or couldn’t, use a computer, providing them with internet services through the more familiar interface of the television. These social enterprise projects and developments aimed to improve the circumstances for the individual, whilst at the same time improve operational efficiency for service providers. One key factor behind these endeavours was the need to create different user interface designs that suited the platform being used. The team’s experience crafting Internet services for TV positioned Big Media well to take a lead in the changing paradigm of mobile and tablet browsing. 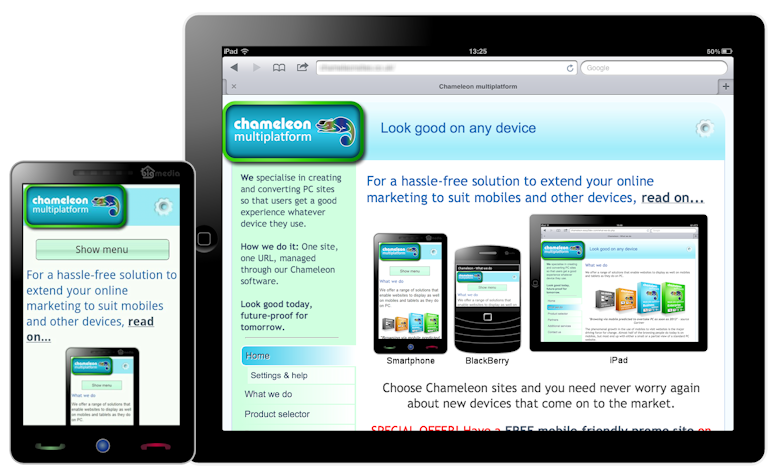 In a number of instances, greater control than that provided by responsive web design techniques alone was needed, and as a consequence, Big Media developed Chameleon software which means websites can recognise the device being used, not just the screen size, and deliver the most appropriate experience. 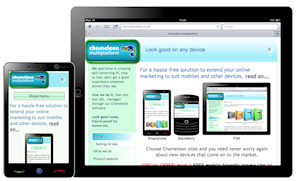 Big Media started back in January 2011 to build on the social enterprise heritage of the previous decade, specifically to deliver cross-platform website projects that made use of tablets, mobiles and connected TVs as well as PCs.